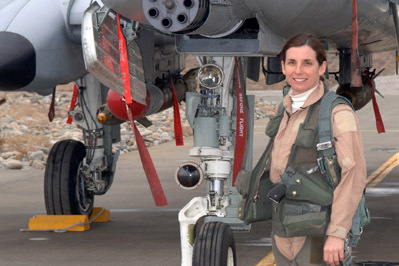 The first woman to fly fighters in combat for the Air Force, and first to command a fighter squadron in combat, is entering Arizona’s special election to fill U.S. Rep. Gabrielle Giffords’ vacated congressional seat. Martha McSally confirmed her intentions Wednesday to join the Republican primary. She made her decision after analyzing three factors: was it feasible, was she electable, and did she feel called to run. […]She commanded a squadron of A-10 attack jets in Afghanistan. After that, she was sent to the Air War College in Alabama, where she finished first in a class of 225 people being groomed as senior leaders. She spent her final three years in the Air Force in Stuttgart, Germany. I’d like to know her views on the definition of marriage, but that’s still a good resume. I think I know one reason why she might be running – her A-10 Thunderbolt II was targeted in the Obama’s administration’s most recent round of cuts to American defense capabilities. I built a model of one of these as a child, and hung it from the ceiling of my room. A great strike platform. I have mounted Rockeye cluster munitions on these guys when playing Steel Panthers and used them to immobilize/destroy multiple Russian T-72s in one pass. The AGM-65 Mavericks are effective at long range, as well. Previous PostSenator Marco Rubio’s speech at the conservative CPAC 2012 conferenceNext PostAre French parents superior to American parents? She’s a tank buster. Now send her to Washington to be a ball buster. Martha McSally is a proven winner! Any challenger should be embarrassed to compare their credentials to hers. She looks like presidential material! Other than seeing her on Fox & Friends, I have not seen or heard anything on her. We should send funds and not let here get away. I will look for info now. It is NOT about credentials it is about facts and the fact is she didn’t know who Pual Ryan is and hasn’t lived in the state for many years. She doesnt know our issues and she doesn’t know who we are. We do not need another “absentee” legislator. Investigate her positions–good luck finding something concrete.